A Liberty Slots player was feeling the magic in the air the other night when she won $46,250 in one miraculous winning spree. 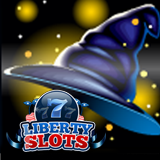 Last week, it was like someone had waved their magic wand over Carol P as the long time Liberty Slots player began an evening of slots play. “I had almost $20,000 in my account so I really went for it on Black Magic. I think I was betting something like $250 a spin. No way I'd do that with my own money, but when you're hot you're hot! When the bonus feature came up, I picked the six crystal symbols and the next thing all I could hear was the sound of winning! $46,250 from one spin! I'll take that anytime!" "Great for Carol,” said Liberty Slots manager Mark Ramirez. “She's been playing here a long time -- she deserves this win! We have a great relationship with so many of our players and it's always so much fun to share in the excitement of a big win like this"